It’s safe to say natural history photographer Clay Bolt is obsessed with North American bees. What began with a few photos in his backyard in South Carolina back in 2014 has turned into a full blown project aimed at helping document the staggering diversity of North American bees. 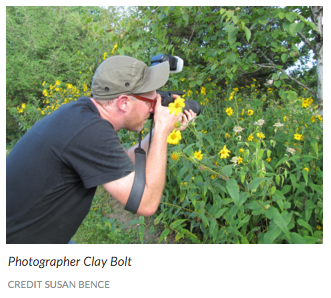 After accidentally photographing two different species of North American bee in his own backyard, Clay began doing some research and learned that there are over 4,000 native bee species in North America. “As I began to do more research, I realized that so little was known about our native species, and so at that moment I realized that I could use my photography to begin to tell some of those stories,” he tells Slate. Last Saturday, A Ghost in the Making premiered in Madison, WI for the 2016 Wisconsin Film Festival as part of the Mad About Madison lineup. Fitting since this is where Clay Bolt discovered his first Rusty-patched bumble bee and truly began his momentous crusade. He discussed the details of this journey in the radio interview below. Listen to his full interview by Susan Bence at Milwaukee Public Radio here. We've just released the trailer for the Rusty-patched Bumble Bee. Check it out and stay tuned for the release of the full film.